They say if there’s an exercise that you don’t like that means that you should be doing more of it. The reasoning is that you dislike it because you are weak at it. Thus if you do more, you’ll get stronger and like it. I hate squats. Huh-ate. That’s HATE with a capital H and a capital ATE. 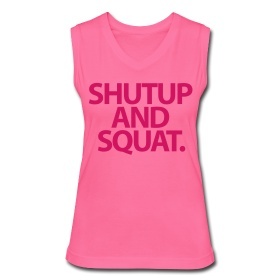 I don’t mind squat variations like sumo squats, split squats, bulgarian squats, one leg squats, and so on. Just regular ole squat squats. Bleh. My alignment feels off even when I’m told it’s perfect. I feel off balance and like I may topple at any moment. My knees creak and I feel like I can’t get back up. All this even at a relatively light weight. Last month my main leg lift was barbell squats. I also had bodyweight squats on glute day so I got more than a fair share of squats in April. I was thrilled to find that I have no squat squats assigned for May! Not a one. I have spit squats, jump squats and sumo squats instead. I’m wondering if “the experts” really are right. I definitely need this shirt. Does doing more make you like them, or does taking a break erase the hate memory and suddenly you like them? Is there an exercise that you absolutely don’t like doing?